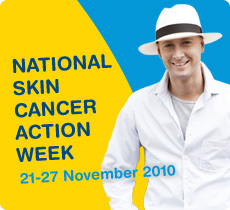 This November’s Skin Cancer Action Week (Nov 18-24), Cancer Council Ambassador and Australian Cricket Captain Michael Clarke will be joining Cancer Council Australia and the Australasian College of Dermatologists to urge all men aged 45 and over to watch their backs. Men in this age group are almost twice as likely to develop melanoma, the most deadly form of skin cancer, than women the same age. Although melanoma can develop anywhere on the body, around 1 in 3 cases in men occur on the back. Cancer Council Australia CEO, Professor Ian Olver, said it is never too late to be SunSmart. Toormina and Sawtell Medical Centres offer comprehensive skin checks to all our patients who wish to have a check up, please make an appointment with our reception.